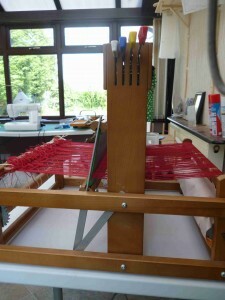 This week I’ve been getting everything ready for weaving my Welsh wool quilt. I’ve decided to weave four 2 metre long strips with a twill weave in contrasting colours. The first strip will have a warp of ruby red wool yarn and a weft of hand spun black, Hebridean, single yarn. Twill is a weave with a pattern of diagonal parallel ribs. This is done by passing the weft thread over one or more warp threads and then under two or more warp threads and so on, with a “step” or offset between rows to create the characteristic diagonal pattern. Because of this structure, twills generally drape well. 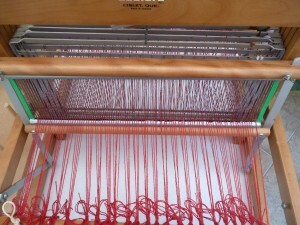 It’s also quite easy to vary the pattern you are weaving without changing the way the warp is threaded. If it all goes to plan I’d like to try several different patterns on each strip of fabric to give a patchwork effect on the finished quilt top. 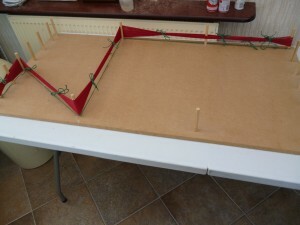 With a 2metre warp to measure I decided to use my homemade warping board. The board simply has wooden dowling rods placed at varying intervals around the edge. I measured out 2 meters using some green twine, so it was obviously different from the warp threads, and then wound on 96 warp threads. When winding on the warp you need to create a figure of eight at one end which makes transferring the warp to the loom easier. With a long warp it’s also important to place ties around the threads at regular intervals to prevent any tangling. 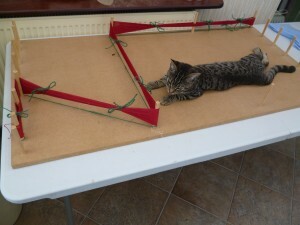 Here’s the warp on the board (Sansa kitten was supervising) To keep count of the threads as I wound them on I tied every 10 threads together with green twine. Once all the warp threads are measured out the tricky bit starts. 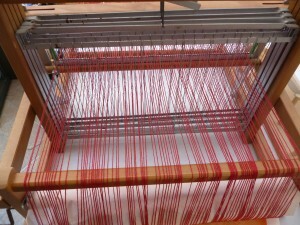 The warp needs to be transferred from the board to the loom and threaded through the reed and heddles without getting all tangled. 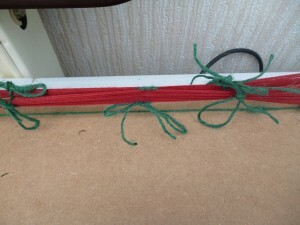 Tying the warps in a large knot at the end, tying ties around the warp and the cross as well as chaining the warp all help keep it from getting tangled. You also need plenty of time and no distractions. Here’s the warp on the loom. The heddles / shafts are threaded in a 4,3,2,1 pattern. I’m also trying out floating selvedges for the first time. With a floating selvedge the warp threads at each edge of the weave are not threaded through any heddles but simply floating. 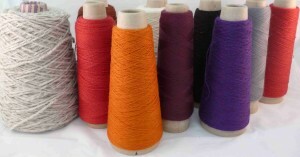 The weft is passed over or under them depending on preference. I’ve got a bobbin full of my weft yarn but need to wash and finish it before I start weaving. Hopefully I’ll be able to get started later this week. What makes a quilt Welsh ? Historically the majority of Welsh quilting seems to have started in the mid 19th century continuing on to around the middle of the 20th century. In Wales the majority of quilting work was done by professional quilters which lead to the development of a distinctive style and high standard of quilting. Generally if you had money and wanted a quilt you employed a professional quilter to make one for you. These quilts were treasured and kept for best, a mark of your success and worth.Professional quilters traveled the country, living with their customers while making the quilt which was generally completed within two weeks. There are three main types of Welsh quilts cotton and multi fabric, wholecloth and woolen. Cotton and multi fabric quilts became popular after roller printed cotton fabrics became more generally available in 1840. A medallion or frame quilt is the style of patchwork most associated with Wales. For Welsh quilters though the patchwork was very much considered second place to the quilting. It is the quilting patterns that identify a quilt as Welsh, the fabrics generally being made in England. The quilting of Welsh quilts follows a basic format consisting of a square or rectangular central field surrounded by one or more borders. Borders were often outlined by double lines and had corner squares. The quilting borders don’t necessarily follow the seams of the patchwork in multi fabric quilts. A variety of motifs were used with designs developing as the quilting progressed and very much being the personal choice of the quilter. Motifs were often passed down in families and quilters prided themselves on the originality of their quilting. 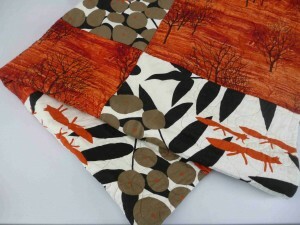 Wholecloth quilts are made from a single piece of fabric rather than patchwork. They became popular from 1880 when satin cotton in a range of plain colours became the favoured fabric for quilts. Satin cotton has a sheen which shows off quilting very well. The Rural Industries Board, which was est up in 1928, encouraged the production of high quality luxury quilts and supported the Welsh quilters in using their traditional quilting patterns in new ways with wholecloth quilts. The influence of the Rural Industries Board also led to the individual travelling professional quilter becoming a thing of the past. Quilters were encouraged to work in groups, with up to four women working on one quilt to achieve the goal of rapidly produced, high quality work. This change in production was no doubt beneficial to the industry as a whole but removed the individuality that came with the travelling quilters whose unique personalities were part of their quilting. The opposite end of the spectrum to the luxury wholecloth quilts of the early – mid 20th century is the very traditional Welsh woolen quilt. Welsh woolen quilts were entirely home grown. The woolen cloth was made in the wool industries of mid and west Wales using wool yarn spun from the fleeces of Welsh sheep. The quilts were filled with wool collected from the hedgerows making them cheap to produce but incredibly warm and practical. 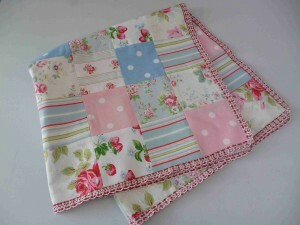 I’m Welsh and I like to quilt my multi cloth patchwork quilts in the Welsh style. I started off choosing motifs based on the fabric or theme of the quilt but overtime seemed to have developed my own personal motifs like those travelling Welsh quilters of old. Much as I love creating multi cloth patchwork quilts I’ve always been fascinated by the Welsh woolen quilts. Now I have my own flock of Jacob sheep , can spin my fleeces and weave my own fabrics I want to experiment with making a Welsh woolen quilt. My plan is to use as much of my own hand spun wool yarn as possible together with wool yarn from other rare British sheep breeds. I’m going to weave fabric on my table loom, I’m not sure yet whether to weave individual squares or longer strips of fabric. Smaller squares allows for more variability and experimentation in the fabric design but longer strips would be more practical with fewer seams. I’m still pondering what to choose and might go for a compromise of a bit of each. I’ve bought a number of coloured warp yarns to experiment with. I’ve decided to stick to using my hand spun yarn for the weft to start with. Here’s a picture of the warp yarns I’ve got to play with. 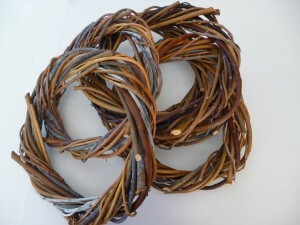 As you can see there are a variety of colours and thicknesses. I’m currently still getting all my fleeces spun but I’m starting to plan various weaves and have a pattern book of 600 different weaves to work through and choose from. Once I’ve woven all the woolen fabric I’ll need to sew the squares or strips together then create the quilt sandwich. I’ll be using a commercial wool batting the first time because I think it will be easier to work with and less time consuming than the traditional hedgerow collected wool. 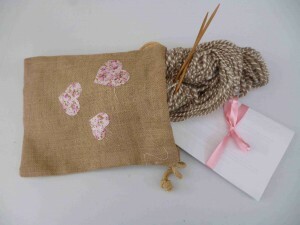 Depending on how the weaving goes I’ll either use a cotton fabric backing or more hand woven wool fabric. Weight and ease of quilting will also be considerations when deciding on cotton or wool for the backing but ideally I’d like to use my handwoven woolen fabric. Once I’ve settled on the design for my fabrics and quilt I’ll post some more details and hopefully it won’t be too long until I have my first Welsh Woolen quilt. This week I’ve been busy getting the next stage of Hooters Hall smallholding up and running. We already sell our home grown, slow grown pork from our online farm shop http://www.hootershall.co.uk/ and now we’re going to be selling craft items on Folksy http://folksy.com/shops/HootersHall and Etsy http://www.etsy.com/shop/HootersHall, all made here at Hooters Hall. Our Hooters Hall Folksy and Etsy shops will stock a variety of lovely things designed for accessorizing shepherds huts or using when staying in a shepherds hut. There will be a big focus on wool, particularly wool from British rare breeds and of course our own flock of Jacob sheep. As well as hand spun yarn rainy day knitting kits and peg loom rugs I’ll be weaving some woolen curtain fabric and cushions. 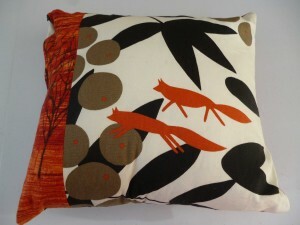 Apart from spinning and weaving I’m an obsessive quilter. I like to mix vintage and new fabrics and will be experimenting with handwoven wool fabric over the next few months, maybe even some handwoven, hand spun, hand sheared woolen fabric.My quilts are shepherds hut size (approx 150cm x 150cm) and also work very well as picnic blankets. I like to quilt in the Welsh tradition with a central medallion with two borders of different widths and finished with a butted edge look. Many of my quilting motifs are inspired by nature with flowers and leaves as well as some Celtic designs. I don’t like to let any fabric go to waste so I use what’s left over from my quilts to make petite tablecloths (just the right size for a shepherds hut), cushions, tea towels, decorations and bunting.